It’s been one week since the hustle and bustle of CES 2016 and we’re still hearing stories and seeing photos of our Case Tank game. Here at Speck, we work hard to show our fans that not only are they getting a slim, sleek, beautiful phone case – but they’re getting one that can withstand daily drops. So at this year’s CES, we wanted to show what that really meant. Over, and over, and over. People can be competitive, and this game brought out the best in that. 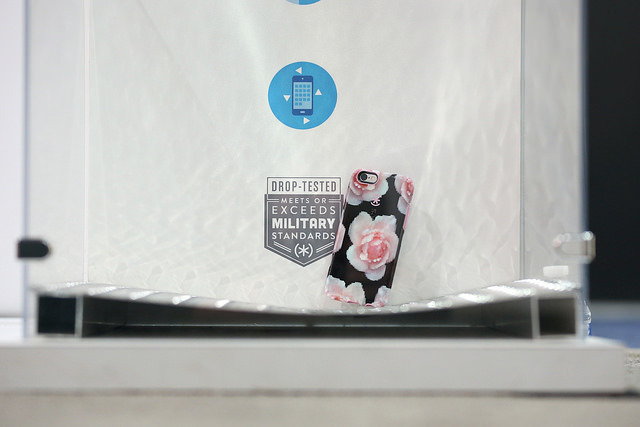 Folks who came by got to throw a bean bag at a lever to drop one of our CandyShell Inked iPhone 6 cases onto a tough metal floor. If you think people were shy about knocking an expensive, shiny device from four feet in the air – think again. We had pitcher-strength throwers, couple tossing teams, and serious lottery-style competitors come by to see if they could knock off a Speck case and take one home for free. Over the course of the entire CES trade show, we dropped one iPhone 6s over 2,500 times onto a hard, unrelenting surface. And yes, the phone remained fully intact with complete functionality by the end of the show. See what we mean for yourself. Check out our CandyShell Clear for iPhone 6s/6, and the rest of our military-grade protective iPhone cases. 20% Off Slim Cases on Fat Tuesday! Protect In Style with the New CandyShell Clear w/ Glitter Phone Cases!